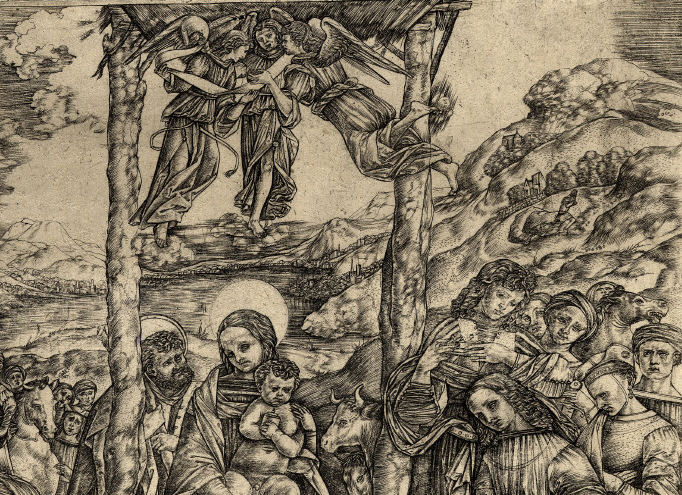 Cristofano Robetta (1462 – 1535 after) is not exactly a well known name, even to those interested in the early history of western printmaking. Over-shadowed by luminaries of his era, print historians have invariably discussed the awkward and technically unrefined aspects of his work. They also point out its heavily derivative nature as Robetta freely copied and combined elements from the work of his high profile contemporaries such as Albrecht Durer (1471 – 1528) and Filippino Lippi (c.1467 – 1504) amongst others. Yet while pointing out Robetta’s shortcomings, these esteemed scholars also frequently mention the ‘charm’ of his engravings, despite their lack of finesse. But what exactly is it that constitutes this ambiguous appeal, which also struck me when viewing these prints for the first time? Robetta, like many early Florentine engravers also worked as a goldsmith, and the 30 or so prints he has left behind reflect the work of an artist absorbed in the cultural milieu to which he belonged. Yet while he freely adapted and paraphrased the work of others, Robetta made his own original artistic contribution through his distinctive technical approach that appears almost experimental in nature. His manner of fine linear hatching is worthy of particular focus. Robetta blankets his surface with innumerable tiny flicks and strokes made with the engravers burin (the tool used to incise marks into the surface of the metal plate from which the resulting image is printed). Like all engravers he modulates the density, length and curve of the hatched lines, in order to create areas of different tone, and thus model the illusion of three-dimensional form through light and shade. Yet Robetta’s style of hatched rendering has a particularly direct and changeable quality as his lines shift length and direction in a manner that appears to evolve spontaneously, and at times haphazardly. One gets the impression of the artist feverishly seeking out the musculature of his figures, the form and volume of drapery, and the undulating natural surrounds in which his scenes are often located. 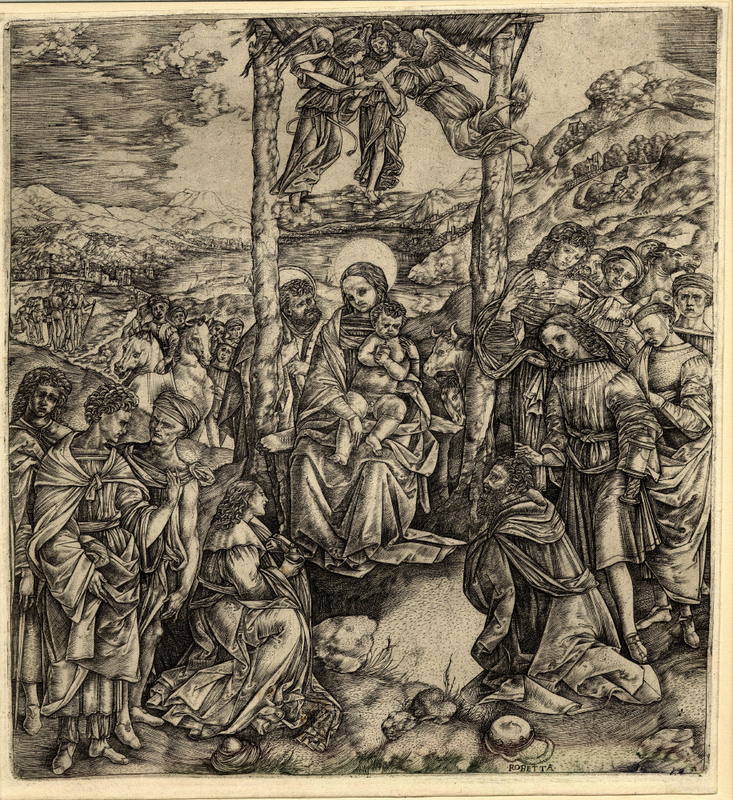 This is in contrast to the classicising perfection that was being brought to a pinnacle during his lifetime by the creative geniuses of Durer from Germany, and Marcantonio Raimondi (c. 1480 – before 1534) in Italy. Hind notes the disparity between Robetta’s idiosyncratic style with the precision and complete mastery of technique displayed by the aforementioned artists, who revolutionized the possibilities of image making via engraving. Conversely, Robetta employed a less regulated system of line-work, and made the occasional slip along the way. 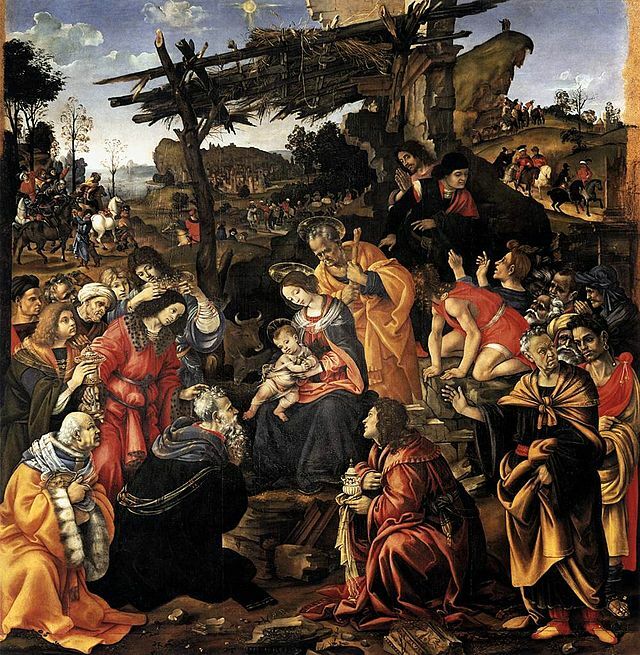 As a result the figures and flowing landscape background that comprise his Adoration of the Magi, after Filippino Lippi appear bathed in a kind of dappled light. His irregular and fluid manner of hatching creates a shimmering quality that lends a sense overall pictorial unity, despite the sometimes cut-out appearance of his figures. 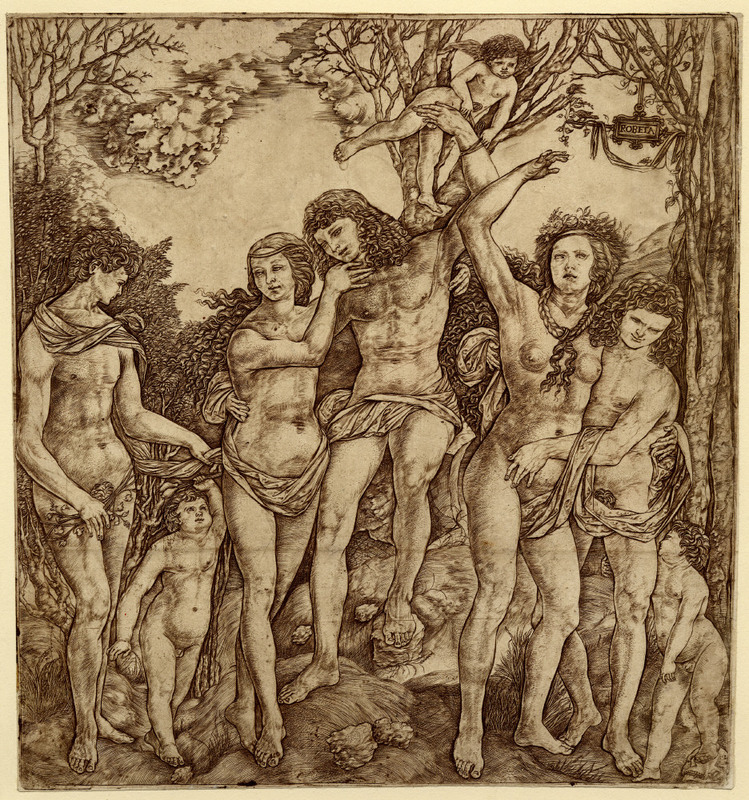 Zucker mentions the term ‘pastiche’ in reference to Robetta’s tendency to incorporate figures of a Florentine style into a landscape borrowed from a Durer engraving and so on. If the work was created today we would say Robetta ‘appropriated’ the images of others, but there is nothing of the self-conscious and ironic inflection denoted by this oft quoted post-modern term. Rather, Robetta employed engraving as a medium to reproduce and disseminate visual ideas and artistic innovations, a practice that was invented during the Renaissance and was critical to the original function of the medium. Below is Fillipino Lippi’s Adoration of the Magi (1496) held in the Uffizi Gallery, Florence. It is illustrated here to show the extent to which Robetta has interpreted and altered his source material, with new compositional elements such as the trio of angels amongst other variations and inclusions. Filippino Lippi, Adoration of the Magi (1496) oil on panel, 258 x 243 cm. Uffizi Gallery, Florence. In Robetta’s Allegory of Carnal Love, the influence of the great Florentine painter Sandro Botticelli (c.1444/5–1510) can be detected in much less direct manner. There are vague compositional similarities to Botticelli’s iconic masterpiece La Primavera (1477 – 1482) also in the Uffizi. This includes the tableau like arrangement of figures and the elegant manner in which their bending and twisting forms are entangled in Allegory of Carnal Love. Like La Primavera, Robetta’s scene is also presided over by a winged Eros at the top of the image and contains a mysterious allegorical meaning, all set within a natural environment. 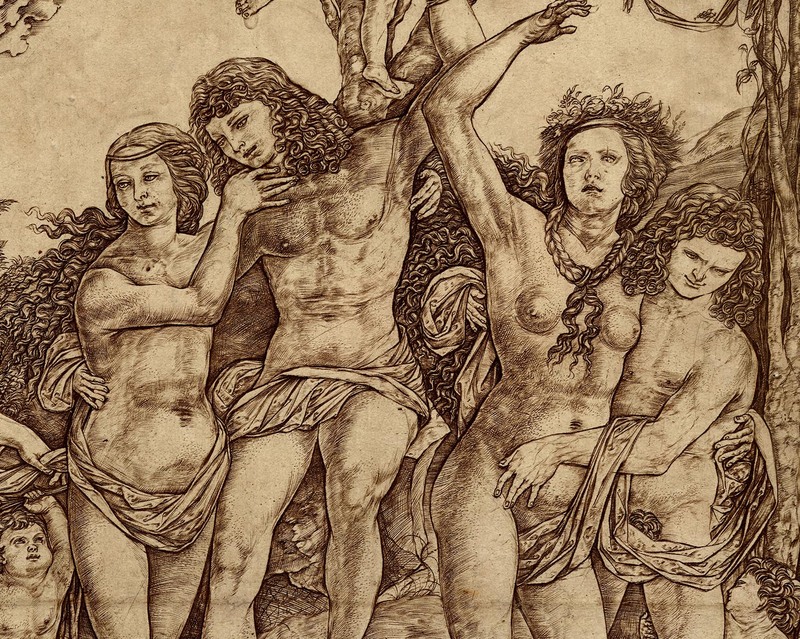 The graceful visual poetry Robetta creates in this engraving, which exists despite stiffness of some figures, contains echoes of Botticelli while retaining its essentially original scheme. It is thought that Robetta lacked formal artistic training, a fact that may be responsible for the lack of regularity in his technique and the sometimes clunky drawing of his figures. Yet paradoxically it is this technical imperfection and variability that in my view creates the appeal of his prints. It contributes to the impressionistic qualities present, which in some ways prefigure looser, more spontaneous explorations into light and surface that were to occupy artists centuries later. Currently I am studying in the Prints and Drawings Department at the British Museum, having been awarded the Harold Wright & Sarah and William Holmes Scholarship, administered through the University of Melbourne. This fantastic opportunity allows me to research widely within the BM’s incredible collection of graphic art. Through this blog I will be sharing some of the most intriguing and often surprising works I have come across as I move through aspects of the collection. With sincere thanks to the Prints & Drawings Department at the British Museum. For further information about each print click on the link under the image to visit the British Museum Collection Online. 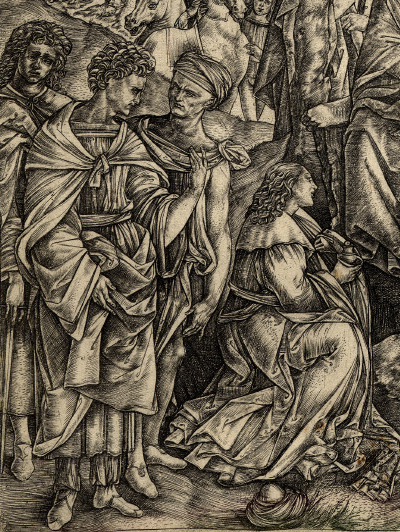 Tags: art, Art History, art writing, British Museum, Cristofano Robetta, Engraving, Filippino Lippi, Florence, graphic art, Italy, Marguerite Brown, Museums, painting, printmaking, Renaissance Art. Bookmark the permalink.